Flood Warning — York Electric Cooperative, Inc. 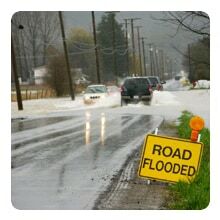 When a flood warning is issued, remove or relocate all electrical equipment to areas well above the estimated flood height. Switch off electricity to non-essential circuits before they are submerged in flood water. If your home is evacuated, unplug all appliances and remove the switch fuses in the meter box. After a flood, when approaching your home, watch for downed wires. Do not drive over them or get close to them. Always assume they are energized and call authorities. Upon re-entering your home, do not attempt to reset circuit breakers until all water has receded. Be sure to wear dry clothes and rubber soled shoes, and stand on something dry and non-conductive, such as dry wooden furniture. After plugging in an appliance, if the breaker trips or a fuse blows, or if you see or smell smoke, disconnect the appliance immediately and call a service person.